Olivia Beckner is fast, and she has her name all over the record books to prove it. 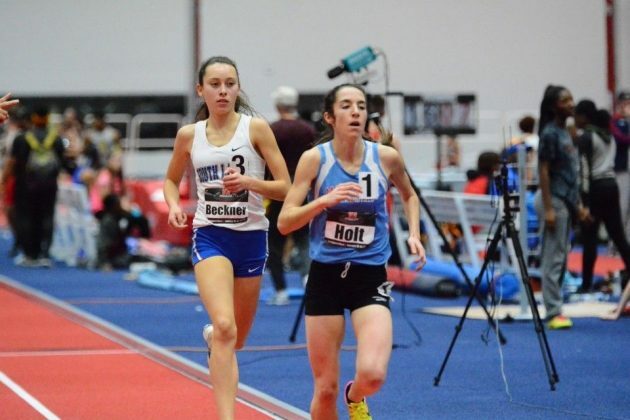 The South Lakes High School junior set her second school record of the month recently, eclipsing by nearly four seconds an SLHS top time for the mile that had stood for 29 years. The record-setting performance came at the Virginia Showcase Invitational indoor track and field meet last weekend at Liberty University in Lynchburg. Her time of 4 minutes, 55.58 seconds beat out the previous mark of 4 minutes, 59.44 seconds set by Anne Evans during the 1987-88 season. Earlier this month at a meet in New York, Beckner ran the 1,000 meters in 2 minutes, 54.06 seconds. That surpassed the record of 2 minutes, 58.47 seconds she had set last year as a sophomore. Beckner leads the five-time defending Liberty Conference champion Seahawks into the conference championship, beginning today and concluding Jan. 28 in Landover, Maryland. The SLHS boys are no slouches either. They enter the championship with eight consecutive titles under their belts.